Performers include: Bill Smitrovich, Patti LuPone, Chris Burke, Kellie Martin, Tracey Needham, Chad Lowe, Monique Lanier, Tommy Puett, Kiersten Warren, Penny Santon, Al Ruscio, Troy Evans, Andrea F. Friedman, Michael A. Goorjian, Dorothy Lyman, and Michele Matheson. This family drama focuses on the Thatcher family, including a son with Down syndrome. Set in the fictional town of Glenbrook, Illinois, it is the first television series to ever have a major character with the disorder. Andrew “Drew” Thatcher (Bill Smitrovich) is the hard-working patriarch of the family who, after leaving a job in construction, runs a restaurant. His wife, Elizabeth “Libby” (Patti LuPone), is initially a full-time mom but, after the restaurant burns, she goes back to work in advertising. 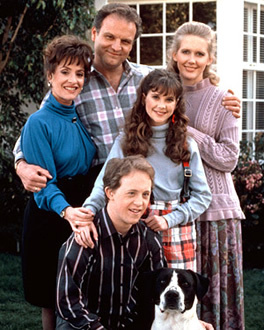 As the show begins, Drew and Libby have three children — Paige, Corky and Becca — and a dog, affectionately credited as “Arnold the Semi-Wonder Dog.” At the end of season two, a second son named Nicky is born. Paige (Monique Lanier, then Tracey Needham) is a young adult and the product of Drew’s first marriage. She moves back into the house and runs through a series of jobs and boyfriends, trying to find her place in the world. She later discovers that she loves building and eventually gets the idea to go into business with her gruff friend and former supervisor, Artie McDonald (Troy Evans). Teenager Charles “Corky” (Chris Burke) has Down syndrome. As the series begins, he starts attending specialized classes at the local high school. Corky had previously attended a specialized school. He eventually gets a part-time job at a local movie theater, moves into his own apartment and meets and marries Amanda Swanson (Andrea Friedman), a young woman who also has Down’s. Rebecca “Becca” (Kellie Martin) is a highly-intelligent and geeky high-school student who’s initially worried abut how her brother’s attending the same school will affect her socially. She falls for (and eventually dates) Tyler Benchfield (Tommy Puett), a nice-guy jock who also has a brother with Down’s. Later, Becca falls in love with Jesse McKenna (Chad Lowe), a young man who became HIV-positive after a chance one-night stand at a frat party. She’s also wooed by her close friend, geeky Ray Nelson (Michael A. Goorjian). In the beginning, the show focuses on the special challenges of having a child with Down syndrome and typical family problems. Later, storylines shift to focus more on Becca’s relationship with Jesse and the social and physical impact of living with HIV and then AIDS. The episode takes place in flashbacks as told by a 10-years-older Becca to a young boy in bed. She recounts how she, Jesse, and Ray (as surprise valedictorian) graduated from high school. Corky does not graduate because of a poor math grade but vows to return. Paige and Artie end up taking over a house that they’ve been working on because the owner can’t pay them. Artie suggests a romance but Paige doesn’t like the idea. Later, Artie convinces her that they keep the house that Paige loves so much. She can live there and they’ll use it as an office too and share expenses. Jesse breaks up with Becca so that she can go on to college and he can go to Europe to try experimental treatments and figure out what to do with whatever’s left of his life. Four years later, before she enters medical school, Jesse returns and they rekindle their romance. They get engaged and married. Back in the future, we see that Becca finishes telling the story. The little boy says, “I love you, Mommy.” And Becca replies, “I love you, Jesse.” and kisses him. First aired: May 23, 1993. To read a more detailed description, go here. There were some discussions about NBC picking up the series for two more seasons but it didn’t happen. In the opening credits of each episode, we see Arnold patiently waiting with his empty food bowl for someone to feed him. In the last episode, as Becca closes the kitchen door, a cabinet opens and dog food comes spilling out. In an Entertainment Weekly article from 1996, Lowe said that it was his belief that Becca’s child was not fathered by Jesse. In the excellent book Life Story: The Book of Life Goes On , series creator Michael Braverman explained that Becca’s son was indeed fathered by Jesse. He wanted to show that, at some point in the future, it would be possible for them to safely have a child together. In one of the flashback scenes, we see graduation pictures of Becca and Corky in the background. Corky apparently did graduate. The end credits are shown over an image of Jesse and Becca kissing at the altar and “Dying to Live” by Edgar Winter plays in the background. On the original broadcast, ABC did not interrupt the audio with promos for other shows. I got the first season on DVD at 1/2 Price Books. When I checked Amazon for further seasons, it appears that there are no other seasons out on DVD. I’m on the 5th of 6 DVDs of the first season and I am remembering why I loved this show so much. It was nice to be reminded again of this quality show. I want to thank the network for allowing it to run as long as it did because I don’t think that would happen in today’s TV market where, if a show isn’t a hit right away, it is canceled. The TV executives today don’t remember that Mash wasn’t a hit when it started nor was the X Files. Those shows needed a little time to find their audience and they are now considered classics. Life Goes On was ahead of its time and definitely quality family programming. No, Michael Braverman is wrong. According to this website, when Becca is telling little Jesse the story, at one point he asks, “Like Daddy?” This implies that little Jesse’s father was not Jesse.